Cec is the daughter of the wartime Vicar of Tilty, the Rev. Hugh Cuthbertson, and his wife Elizabeth (Betty). She was born in London, but the family moved out because of the war – first to an aunt in Finchingfield, then to the parish of Tilty in 1940. Cec’s memories are summarised below; click here for .pdf version of file. Cecile was very young during the war – only two years old when the war started – but has very clear memories of the families of refugees in the house, and of the planes going over the house on missions – from the various airfields in the vicinity (Little Easton, Debden and Saling). She also remembers the plane, the Mosquito, crashing behind the church, as the date was near her birthday [just before, on February 5th 1944]. There were also the planes flying off to Arnhem – she thinks her parents must have told her later where they were going; she remembers seeing all the gliders going over; a very clear memory. They all knew that something big was going on, because the sky was just full of planes – planes and gliders, carrying the troops. The Mosquito crash. Cec remembers her father’s panic, not only because there was a plane and its crew in trouble, but because it might hit the church. 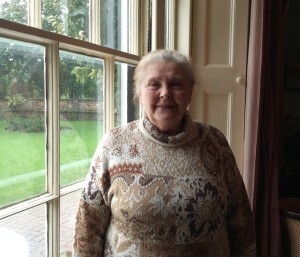 Cec was kept back by her mother – but recalls that lots of local people came to help. There was also a bomb dropped at the bottom of Duton Hill, just by the bridge. Cec’s father sent everybody home, in case the bomb exploded – but it didn’t. Another bomb fell at Thatched Cottage – opposite Grange Farm – in the garden. There were allotments at the bottom of Tilty Hill; at the bottom of the road, on the right hand side – going towards Dunmow – there was a big allotment at the bottom of the field. Cec remembers the impact of the refugee children and their families on life in the Vicarage, and the differences in their ways of life and behaviour; the refugee children and families, all from the East End of London, noticed that Cec spoke beautifully. On the other hand, Cec’s father was very shocked when he realised that she was picking up some of their way of speaking – ‘fer’ilising’ instead of fertilising, for example. Cec’s mother, Betty, had a big vegetable garden in the grounds around the house; food was in very short supply, and there wasn’t much to buy in the shops. Cec’s mother also kept chickens, and her father kept a lot of rabbits – for selling, as well as for home use – but he didn’t do it for very long, as he didn’t like skinning them. So many rabbits! They had about two hundred at one time. They were all kept in hutches in the shed. Cec used to help out and assist in feeding them. But she wasn’t allowed to name them! There were many evacuees at the Vicarage. Children at first, but afterwards families [see Barbara De ‘Ath’s story about the Mitchell family]. Cec remembered a little boy who swallowed a drawing pin, and her parents watching and waiting anxiously, to see if it emerged safely – which it eventually did. Because of the size of the house, there were quite a few refugees; each of the upstairs rooms had one family in them. One family moved into the Vicarage, but after a couple of days decided to move back to London, as it was much too noisy in Tilty – because of all the airfields around, the ack-ack gun up on the hill, and the planes going over all the time; it wasn’t the quiet countryside they thought it was going to be! Education; the children went to Great Easton school mostly. It was a much smaller school then – just the old building, without the later extensions. Miss Langman was the headmistress at the time. Cec went to Thaxted school, not Great Easton; she travelled there on the bus – her mother would walk her down to the corner to catch it. A slightly older child – Pam Cass – was put in charge of Cec on the bus. There were other local schools – at Little Easton, and at Broxted. Little Easton school was where the B&B place, ‘Roslyns’, is now. Broxted school was on the corner, as you turn left to Stansted, where there are now two new houses built – opposite School Villas. Cec later taught at Broxted School (in the 1960s), as a locum while somebody was on holiday. Cec has allowed us to scan many documents and photographs from her father’s collection of wartime material for the archive, which are also published on the website. She also remembers her mother’s jewellery-making during the war (referred to by Barbara De ‘Ath), and the brooches and pendants that she made from sealing wax.